(CNN) — Anti-China protesters gathered Saturday in Tokyo and six other major cities in Japan to rally against what it calls an invasion of disputed islands that both claim are part of their territories. Beijing says the Diaoyu Islands and most of the South China Sea belong to China, disputing neighboring countries’ claims. In Japan, the islands are known as the Senkaku. Tamogami called China a “thief” and vowed to protect the islands. Beijing and Tokyo have been clashing over the arrest of a Chinese fishing captain by Japan off the disputed islands. The captain was accused of hitting two Japanese coast guard ships and obstructing public officers while they performed their duties. “I am very angry with China,” said student Shohei Fukumoto. China should apologize and pay for the repair of the vessel because the captain was in Japan’s territory when the accident happened, according to Fukumoto. Japan has since freed the fishing captain, who returned to a hero’s welcome in China. Yoko Sakamoto, 55, said Japan has been too easy on China. The captain’s arrest prompted the suspension of diplomatic talks and canceled trips between the nations. 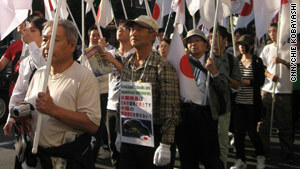 Beijing has sought an apology and compensation over the arrest, which Tokyo has rejected. Japan has also demanded compensation for damage done to coast guard ships. China accused of invading disputed islands. With a fishing boat? Against two Japanese coast guard ships?